Review on GameZone - 8 out of 10 "...is the best Sudoku game in town"
Review on IGN - 7 out of 10 "...elements that really sell this version over the other ones"
All Sudoku games are NOT alike! Telegames has again teamed with Puzzle.tv, the world’s leading quiz-meisters, to create the largest and most comprehensive compilation of Sudoku puzzle games ever released for a portable gaming system. Unlimited number of puzzles - virtually infinite number of puzzles, thanks to an internal algorithm that randomly generates puzzles. Four grid layouts: 9 by 9, 8 by 8, 6 by 6, and 4 by 4. Uses touch screen and stylus. Multiple difficulty selections, including sections for younger players. Use erasable pencil marks to help solve the puzzle...without tearing the newspaper! Select your choice of background from 10 cool images. Compare your best times to solve the puzzles with target solution times. On-screen "How to play" instructions and button actions. Save the puzzle status and other options for later. PC-style menus allow easy and intuitive configuration and navigation. 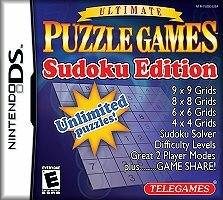 Sudoku Solver - manually input any puzzle from any other source and solve the puzzle using your DS and UPG-SE. Wirelessly play all head-to-head modes with either one or two game cards. Game Share feature - wirelessly download the entire game to another DS for their independent play or for multi-player action. It’s even easier than sharing music files…and it’s FREE!